From the hands of the artisans who spin and dye the cotton fibers, to the hands of those who weave the rugs, each Lorena Canals item has been handmade by our artisans in the north of India, using ancestral manufacturing techniques. This is the reason why our products are unique and original, so you won't find two of the same items in the world. The Lorena Canals company has chosen to use raw materials with a natural origin, and these are mainly cotton and wool. These materials are environmentally friendly without sacrificing the excellent quality that defines the brand. 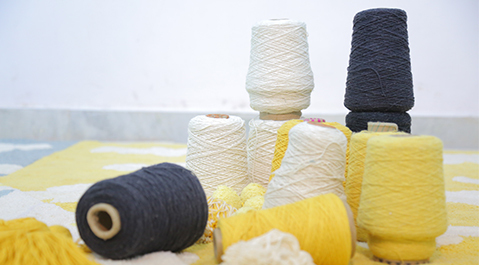 Our cotton plantations are situated in the northeast of India, which is one of the regions where this plant has been traditionally gathered for centuries, and where the artisans hand select the best cotton fibers to make the washable rugs and accessories. Applying natural dyes, which allow us to achieve the best results, and be respectful to the environment, produces the colors of our rugs and accessories. This process concerns mixing natural dye powders with very hot water. Once the dye is prepared, it is placed in a stone bath filled with water and the mixture is diluted. 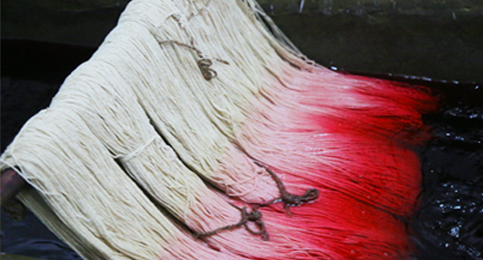 The cotton fibers are then wrapped round a stick and submerged in succession until the desired color is obtained. Theses fibers are then hung in terraces to dry in the sun. 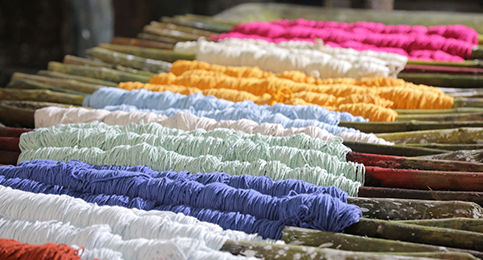 Once dry, they are taken to the factory in order to make the cotton reels. 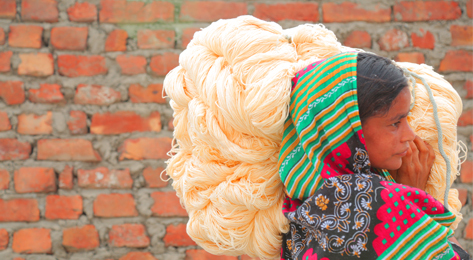 Cotton, wool, natural dyes... we take care of the environment together! We are not just concerned with designing exceptional quality rugs, as we are also highly concerned for Mother Earth, our home and our future. This is why we help to reduce CO2 emissions by promoting the use of natural resources and traditional means of production, in the same way that we are responsible for waste treatment. Our factory in India is ISO9001, 14001 and 18001 certified. The washable, acrylic and wool rugs are certified by AITEX (Textile Technological Institute), which authenticates compliance with the European regulations for products intended to be used by children. 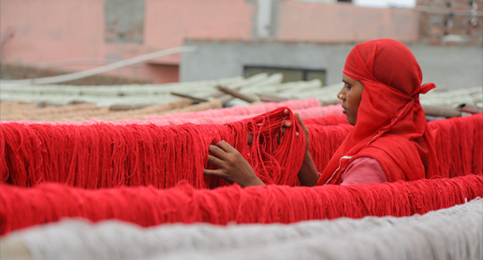 Discover the manufacturing process of our rugs which are handmade with natural dyes and raw materials of exceptional quality.